iSpy uses your Webcams and microphones to detect and record movement or sound and provides security, surveillance, monitoring and alerting services. Any media that is captured is compressed to flash video and available over the Web/iPhone or via the built in web server. 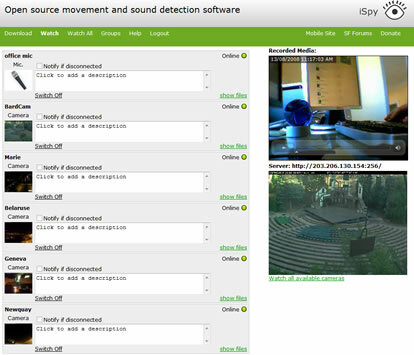 iSpy can run on multiple computers simultaneously and you can use the built-in Web server or our Web site to view captured media, live Webcam feeds and control iSpy remotely. ...... Import and export object lists to share with colleagues. Qweas is providing links to iSpy 3.9.1 as a courtesy, and makes no representations regarding iSpy or any other applications or any information related thereto. Any questions, complaints or claims regarding this application iSpy 3.9.1 must be directed to the appropriate software vendor. You may click the publisher link of iSpy on the top of this page to get more details about the vendor.